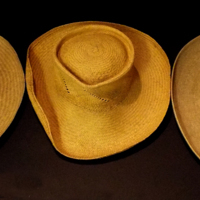 3 woven straw hats likely from Mexico or generally from Latin America. In shape, one is similar to a "ridgetop", one is similar to a "telescope" and the other a sombrero design. unknown, . “Stetson style hats (Mexico? ).” Truman Warner Anthropological Collection, MS048. WCSU Archives, 6 June 2018. Accessed on the Web: 23 Apr. 2019.